Full track details, accompanying artists and dates listed at end of review. Philippe Jaroussky, with more than a little help from Danielle de Niese, William Christie and others, recently convinced me that Monteverdi’s L’Incoronazione di Poppea is not the also-ran to L’Orfeo and Il Ritorno d’Ulisse that I’d always considered it (Virgin Classics DVD 0709519: Recording of the Month - review). Consequently I had high hopes of this recording, especially as there are three items from that opera here, sung this time not with de Niese but with Nura Rial, L’Arpeggiata and Christina Pluhar (tracks 11, 12) and Marie-Nicole Lemieux and Ensemble Artaserse (tr.30). I was certainly not disappointed; this surely is for me, as the French title puts it, a dream recital. 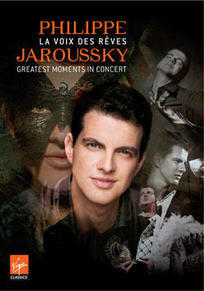 Jaroussky enjoys everything that he does - even in concert he’s performing as well as singing - and everyone involved clearly enjoys working with him. Some of the items here have already appeared on CD; from a a two-disc set entitled Une Fête Baroque which I reviewed some time ago come Venti turbini from Handel’s Rinaldo (tr.4), the duet with Anne Sofie von Otter as Cornelia and Jaroussky as Sesto, Son nata a lagrimar (tr.5), and the Purcell duet Come ye sons of Art (tr.6). Just to confuse the issue, the new 2-CD set mentioned below includes a different, new version of Venti turbini. I thought Une Fête Baroque an ideal place to start to appreciate the music of that period - review - and the performances included here are all the more recommendable for being able to see them. More seriously, the DVD/blu-ray hit the shops at the same time as an inexpensive 2-CD set, Philippe Jaroussky: the Voice (Virgin 6026602) where most of the items are duplicated, albeit recorded at different times, mostly in the studio and with different ensembles. For reasons which I’ve set out below, I recommend the DVD or blu-ray in preference to the CDs and the blu-ray in preference to the DVD. In addition to those considerations, only six tracks of the 32 on the 2-CD set are new to that format. I should add, however, that Philippe Jaroussky’s very light counter-tenor - almost more soprano in timbre than alto - is not to all tastes. It’s worth persevering to acquire it but if it just isn’t for you, then this will be the programme not of your dreams but of your nightmares. I think that will be a decidedly minority response, mainly from those who have trouble relating to the counter-tenor voice at all. Such listeners could try some of Jaroussky’s CD recordings from Naxos Music Library or Spotify. Not only Nura Rial but all the distinguished partners with whom Jaroussky joins in duet in some of the items give of their best. I was a little disappointed with Pascal Bertin’s performance as the second counter-tenor in Purcell’s Sound the trumpet (tr.6); what would normally have been a very adequate contribution is somewhat drowned by Jaroussky’s greater force. He’s out-sung by Marie-Nicole Lemieux in Nel profondo cieco mondo, but that’s intended as part of the fun. A strange consequence of the lightness of the timbre of Jaroussky’s voice is that when singing with a soprano he sometimes appears to be singing in a higher register than his partner. As on the new 2-CD set and as a demonstration of Jaroussky’s versatility, not all of the music here is from the baroque era. Latin American features, for example: there’s a fun item in the form of the title track from the recent Virgin Classics CD Los Pájaros perdidos - review - and a ‘cadenza’ to the performance of Sound the trumpet when you might be forgiven for thinking that Edmundo Ros had invaded the stage. It’s a shame that we couldn’t have the Pie Jesu from Fauré’s Requiem which he sings so beautifully on the 2-CD set, but there’s a compensatory bonus in that the Shostakovich on track 29 reminds us that he’s also an extremely accomplished violinist. With that 2-CD set released at the same time, containing Jaroussky performances of some of the same repertoire, what is to be gained by having the blu-ray? Well, for starters, there’s very little difference in price between the two and if you have a good blu-ray player linked not just to your television but to an audio set-up - see below for a recommendation - the sound quality of blu ray exceeds that of a CD. If you’d like to educate yourself in different styles of conducting (or not conducting) and the various and varied instruments employed by different ensembles - all manner of sizes of lutes, archlutes, chitarrone, theorbos, baroque guitars in the continuo; single strings as against multiple strings - this would be a good place to start. The blu-ray picture is stunningly clear. I haven’t seen the DVD equivalent but, as I see that most dealers are charging only a little extra for the blu-ray, I’d go for that if you can. If you haven’t yet launched into blu-ray and you have a suitable wide-screen television with HDMI inputs, there are some good and unbelievably inexpensive players on the market now; if your budget will run to it, however, I’d recommend spending a little extra on the Cambridge Audio 651BD for £500 from Richer Sounds; it also handles SACD, CD, DVD and mp3 discs superbly well. Played via its predecessor, the 650BD which is linked to my audio set-up, the sound is every bit as excellent as the picture quality. Even played through the television, the sound is good, allowing for the different acoustic properties of the various venues. There’s absolutely no unwanted picture ‘noise’ from the candelabra in the Versailles recording. One disadvantage of the clarity of picture is that the camera dwells in too much detail on individual performers in some of the programmes - I really don’t want to see them warts, wrinkles and all, nor do I want to have the screen split in three or to see multiple reflections of the performers. In fact, there is as much variety of camera-work between the various concerts as there is of baroque instruments, with some of them filmed in a much more conservative manner. The booklet is barely adequate, with no information about any of the music, not even the first names of the composers. I’d have loved to know more, for example, about Barbara Strozzi’s secular cantata Eraclito amoroso and whether the Heraclitus in question is, as I take it, the Greek philosopher who maintained the principle of constant change (panta rhei). I assume that it is, since he laments the change (la cagione) that has overtaken him through falling in love. I can, however, point you to a free online score - here. The on-screen information varies in quality from venue to venue; in some cases we are told which castrato originally performed the role, but not in others. For all my reservations about the printed presentation and despite the availability of a very similar Jaroussky programme on a slightly less expensive 2-CD set, you should find this blu-ray release both instructive and enjoyable. If you decide also to buy the CDs your satisfaction should be even greater; at the prices currently being advertised by some dealers online you should be able to have both and still have change from £30 - that’s over five hours of music for less in real values than we used to pay for one full-price LP in the 1960s. Ensemble Matheus/Jean Christophe Spinosi - rec. Lyons, 2 February 2006. Anne Sofie von Otter (soprano); Pascal Bertin (counter-tenor); Le Concert d’Astrée/Emanuelle Haïm - rec. Paris, 19 December 2011. Ensemble Artaserse - rec. Versailles, 16 June 2009. Nura Rial (soprano); L’Arpeggiata/Christina Pluhar - rec. Metz, 7 October 2009. Marie-Nicole Lemieux (soprano); Ensemble Matheus/Jean-Christophe Spinosi - rec. Paris, 4 June 2007. Ensemble la Fenice/Jean Tubéry - rec. Lyon, 10 November 2010. Nuria Rial (soprano); Ensemble Artaserse - rec. Rueil-Malmaison, 28 February 2008. Concerto Köln - rec. Munich, 24 November 2010. L’Arpeggiata/Christina Pluhar - rec. Ambronay, 18 September 2008 and Paris, 31 January 2012. Jérôme Ducros (piano) - rec. Verbier, 27 July, 2009. Quatuor Ebène - rec. Paris, 17 December 2010. Marie-Nicole Lemieux (soprano); Ensemble Artaserse - rec. Baden-Baden, 24 June 2012.